The beautiful Angela Bassett is back looking fine, doing fine, and promoting her hew film, promoting Hillary Clinton for president, and chatting it up with the homies on The Breakfast Club. Check out the details after the break. 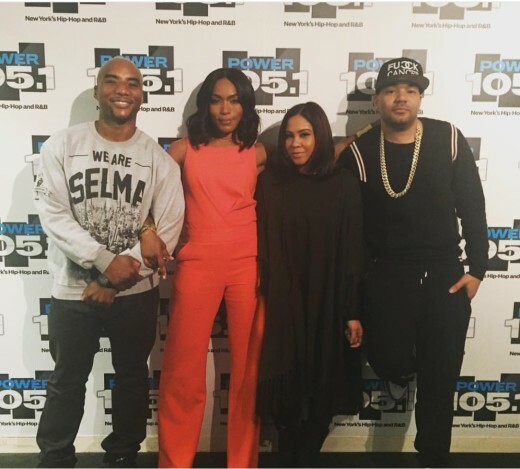 Angela Bassett chats with Angela Yee, Dj Envy, and Charlamagne the God about her new film “London Has Fallen“, her successful film career, why she decided to do television, endorsing Hillary Clinton and much more. The sequel to the worldwide smash hit “Olympus Has Fallen,” a non-stop, suspenseful action thriller that delivers high-octane excitement through a heightened sense of authenticity. The visceral intensity springs from a timely premise: after the British Prime Minister passes away, his funeral becomes a target of a terrorist organization to destroy some of the world’s most powerful leaders, devastate the British capital, and unleash a terrifying vision of the future. The only hope of stopping it rests on the shoulders of the President of the United States (Aaron Eckhart) and his formidable Secret Service agent (Gerard Butler), and an English MI-6 agent (Charlotte Riley) who rightly trusts no one. Morgan Freeman also stars as the Vice President of the United States. Cast: Gerard Butler, Morgan Freeman, Aaron Eckhart, Angela Bassett, Melissa Leo, Charlotte Riley, Radha Mitchell, and Jackie Earle Haley. VIDEO: “The Breakfast Club” Debuts in Atlanta and on #REVOLTforBreakfast!